I sleep next to the chicken coop. To be clear, my bedroom is in the back corner of the house and the chicken coop is right outside my window off the back porch. The coop is no Taj Mahal; I built it out of scrap wood, some chicken wire, and lattice. A Wal Mart tarp shades my hens in the summer and keeps the rain out of their roosting area, which I made by placing a two by four and a sturdy branch across the width of the enclosure. My daughter Maria helped me make a door out of lumber and chicken wire, and the side gate serves as the back door. For two years, I let the chickens run on the side of the house. I began with four chicks, guaranteed by the feed store salesman to grow up to be egg-laying hens. Since they may not be totally legal at my home—I didn’t ask, don’t wanna know!—I chose not to get a rooster which tends to draw complaints from late-sleeping neighbors. I feed them (the hens, not the neighbors) grains and all our food waste like vegetable peels, unwanted leftovers and the like. Every few months I turned the soil and laid down fresh straw. Over time my girls, as I like to refer to them, composted the entire area. When they moved in the ground was hard-packed dust; now it’s lovely fertile soil. This year I moved the girls down toward the back of the house, sealed off the side yard and planted corn. At this time, the corn looks lush and is thriving. It turns out I am not the only one that likes my chickens. A few generations of skunks visit seasonally to help themselves to the grain and leftover leftovers. They also drink the chickens’ water. I’ve seen possums in the coop too. Chickens can’t see at night. Just after sundown they make their way into the covered area, and flap their wings hard enough to get themselves airborne to their roost (elevation 4 feet). The closed gate presents no challenge to the skunks and possums, they just tunnel under. Last night I saw a very large skunk squeeze through one of the three-inch holes in the lattice. 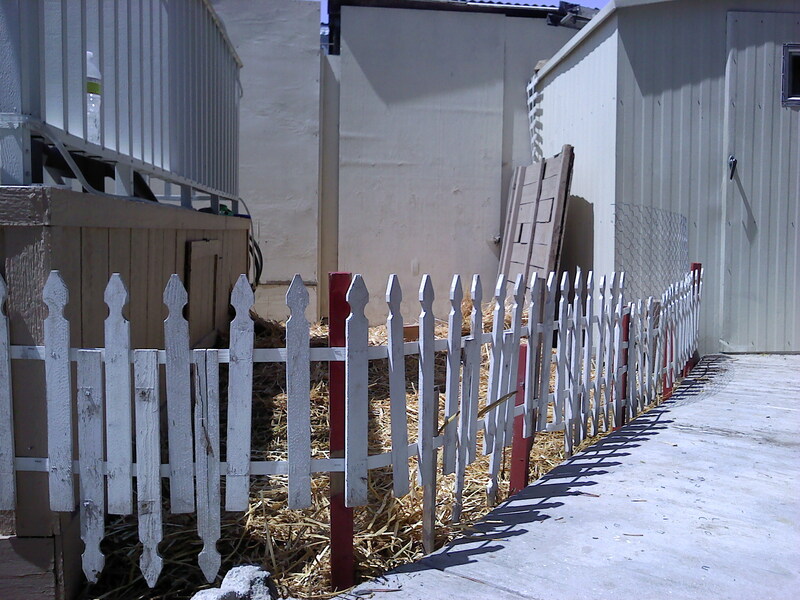 At first I used a decorative picket fence about two feet high to keep the chickens in their area. I figured the skunks and possums hadn’t bothered them so far and as long as I fed the chickens they weren’t inclined to wander outside the perimeter. This allowed the chickens to have a larger area in which to free-range. One day, a chicken was missing. Knowing they like to flock together, I couldn’t figure out why it left. I looked around and eyed my cats suspiciously. Nah, they leave fur or bones or even some lovely entrails on my carpet when they catch a bird, and they’ve never brought in anything larger than a starling. I couldn’t imagine them with a whole chicken. Widening my search area, I checked on the hillside and found some feathers, but it wasn’t enough evidence to make a determination as to what happened. The next evening, I was in the house when I heard squawking, wings flapping and a general atmosphere of alarm. I ran out onto the back porch just in time to see the tail end of a canine-shaped animal fleeing up the hill. I checked the chickens and sure enough, the count was down by one. In my naiveté, I thought, well, the coyote had his chickens; he’ll just be on his way. Looking back, that was a stupid thing to think, because the next day, another chicken was gone. The following day, I was on high alert. The slightest sound from the chickens and I was on the porch, performing a perimeter check. Nothing. The surviving chicken was anxious also, her post-traumatic stress response triggered by the slightest disturbance. I wondered how many chickens the coyote could consume in a week. I learned the answer: as many as he can get. He didn’t come that night, but the next night, the chicken alarm went off, and I was instantly outside. This time, I saw him. He had the sole surviving hen in his mouth, but when he jumped the fence he lost his grip on her. She flopped to the ground and was up in an instant, shaking her feathers and her head as if to say, What in the world just happened? If you’ve ever had a near-death experience, you know how that girl felt. With one hen left, I realized I needed a higher fence. I made some modifications using wood lattice that I discovered behind the shed. I lashed the wood to the back porch and reinforced the gate. I headed to the feed store and bought three more chicks. I locked my hen inside the coop every night. The coyote appeared to have moved on. After a few months, my chicks were big enough to move outside. At first the hen didn’t like them and pecked at them when they came close. But the three new chicks flocked together and fended her off. As time passed, they grew to be the same size as the first hen but the pecking order prevailed. I wondered if they knew they were on equal footing size-wise, or maybe they were just respecting their elder. I grew lazy and stopped locking them in the coop at night, thinking my five-foot high lattice fence would keep them safe. One day, I returned from some errands and checked the backyard. Something was amiss. A huge swarm of bees was buzzing above the neighbor’s tree. Something had created a disturbance, but what? I counted the chickens, and sure enough, only three nervous hens were hiding in the coop. My current solution is vinyl lattice and some four-by-four fence post. I have double thicknesses of lattice, screwed into the porch and the posts. But the threat remains: I know as long as I have chickens, the coyote will want to order them from the backyard menu. Sure enough, I awoke one morning to discover my cat on my bed up on her haunches like a meerkat staring intently out the back door. I followed her gaze outside and could just barely make out the coyote. His fabulous camouflage made him difficult to see, but there he was, standing behind some shrubs on the hillside, gazing longingly at my chicken coop. I slowly got up and made my way to the back door, admiring nature’s handiwork. He was as big as a German shepherd, and his multicolored fur blended deftly with the dappled shadows and the fallen dead leaves that littered the ground. He sensed my presence and looked at me. Our eyes locked in mutual respect. I understand that he is hardwired, programmed to kill and eat his prey, and he is good at his job. I like to think he was approving of my new fence construction, but it was probably just wishful anthropomorphism on my part. I opened the screen door and he turned and loped up the hill. One night last week I was sound asleep when I heard the chickens squawking nervously. Instantly I was awake and again noticed the cat on my bed up on her haunches staring out the sliding glass door. On full alert, I lunged toward the door. But somehow I was wrapped in my bed sheets and could not unravel myself. I crashed to the other side of the bed and fell onto the carpeted floor, still tangled up in the sheets. The loud thumping and clatter was certainly heard outside and I heard a swooshing sound and animal feet running away up the hill. Apparently the noise I made was enough to frighten my coyote away. I managed to extricate myself finally and stood up, making sure the coyote was really gone. That’s when I noticed my injuries. I had pain in my rump, on my ribcage, and across the back of my underarm. My knee was throbbing and closer examination revealed a first-degree rug burn. Now I was injured because of the damn coyote. But the hens are still safe, at least for now. Lisa O July 14, 2011 @ 8:35 a.m. Please comment on my story! I love constructive criticism. The photo was taken before the improvements. Twister July 14, 2011 @ 9:12 a.m.
You piece is too long. Do you know what paragraphs are? Suggest you edit in the future. If this was intended as a humor piece, it should have been even shorter. Coyote-proof enclosures are possible, so obviously yours wasn't, despite the "improvements." You should have shown detailed pix of the improvements if you wanted advice. In any case you are failing (as have I, in the past) to meet your responsibilities to protect the animals in your charge--you can't blame it on the coyote. Visduh July 14, 2011 @ 8:07 p.m.
Twister, I agree. But her style is "stream of consciousness", a la James Joyce. nan shartel July 16, 2011 @ 12:58 p.m.
danceoff456 July 16, 2011 @ 4:23 p.m. Thank you Nan. I appreciate your comments. Next blog I will have paragraphs, now that I know how to edit online. Yeesh! nan shartel July 17, 2011 @ 1:35 p.m.
keep on going gal pal!! Lisa O July 14, 2011 @ 9:14 p.m.
Dear Twister, Thanks for reading! I wrote my story in a different program and copied it into the blog. As a result, my formatting was lost. Because of what you said, I realize that I can re-input my formatting into the blog form. Again, thank you. danceoff456 July 14, 2011 @ 9:56 p.m. I helped build the chicken coop and my fantastic mother and I bought lumber and brought out the hammer and nails and worked hard on making a home for our prize hens and we tried our best to make the coop coyote-proof and by the time we finished we were sure the coyote wouldn't get to our hens. The coyote doesn't give up and will keep trying until he gets them. My mother and I will continue to make improvements and will ward of any kind chicken-eating coyote. We worked as a team and together we thrive. Thank you for commenting on our story and we hope you have a great day. Thank you. nan shartel July 17, 2011 @ 1:37 p.m.
Twister July 17, 2011 @ 9:16 p.m.
Good editors are pure gold to me. I've never written anything that couldn't be improved . . .
Lisa O July 18, 2011 @ 9:59 p.m.
thanks for the help. I'll be sure to double space next time! nan shartel July 18, 2011 @ 2:19 p.m.